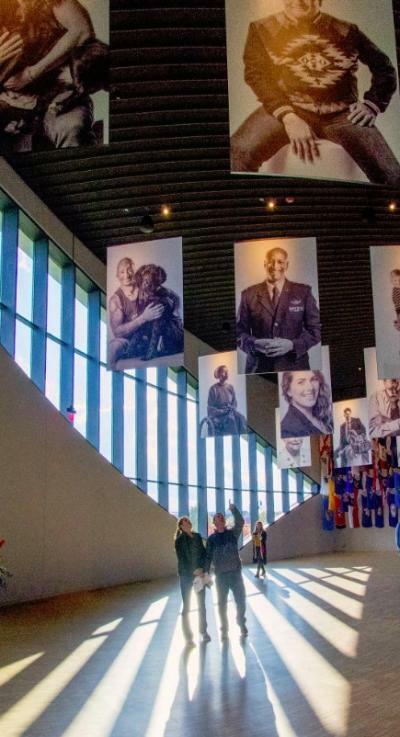 When it opened this fall, the National Veterans Museum and Memorial made quite a splash. It&apos;s the only place in America dedicated to telling the stories of veterans of all branches of military service over the course of all conflicts. It&apos;s housed in a structure Architectural Digest called one of the most important buildings to be completed this year. The experience inside is based primarily around storytelling. Exhibits in the succinct circular space take place in a series of alcoves, where the different parts of a service member&apos;s journey are told, from enlistment to swearing in, to training camp, to wartime service to coming home. While there are a few artifacts, they tend toward the personal (letters from home and tokens of good luck,) and the experience of military service is explored primarily though personal stories. Video interviews from a diverse array of veterans narrate the way, leading to a powerful understanding of the sacrifice veterans make, as well as the similarities and differences of their military experiences. 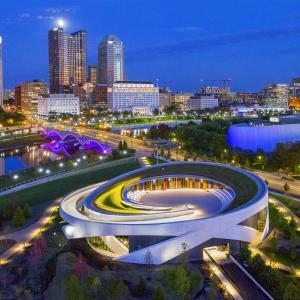 The spiral nature of the memorial and museum&apos;s layout lend to a progression of storytelling, where you can learn more about individual veterans, like Columbus&apos; own John Glenn, who was a catalyst for the creation of the memorial before his death in 2016. 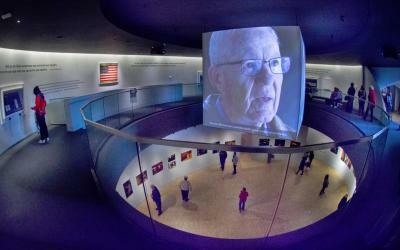 The final stop on the first floor is a circular catwalk with views of an enormous four-sided screen sharing in-depth reflections on service from veterans. The lower level has a space for rotating exhibitions. The top floor is lit with color-infused light coming from representations from medal bars from each conflict American military members have served in. It&apos;s a reflective space, with a powerful double-mirrored remembrance gallery that puts you in the place of a military family member receiving a flag at the service of a fallen service member. An outdoor rooftop area presents an amphitheater surrounded by the skyline of the city, where military homecoming ceremonies will take place. Outdoors is a 2.5 acre memorial grove, where visitors can spend some time in silent contemplation and reflection before returning to their daily lives. A grove of elm trees, a long stone wall with three waterfalls and a reflecting pool provide a peaceful end to the visit. 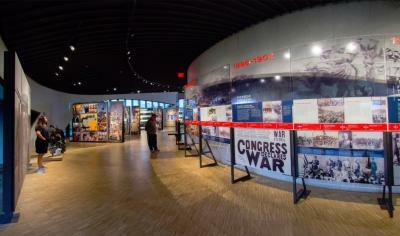 The National Veterans Memorial and Museum is open Wednesday-Sunday, 10 a.m.-5 p.m. Admission for veterans is free. Standard adult tickets are $17 with discounts for active duty military members, seniors and children.